Jessica Chastain has had a couple of years that any aspiring actor would likely envy, and she’s basically come out of nowhere, too. Look at her credits before she came into most people’s consciousness with that Tree of Life/The Help combo in 2011. It continued in 2012 with Lawless and Zero Dark Thirty, and by that point it was like Chastain had been around forever and she is and always was our next Meryl Streep or Cate Blanchett. So it was odd to see her pop up in a January horror movie, even with Guillermo Del Toro as a producer. The current Rotten Tomatoes score for Mama is at 65%, which is astounding, because it’s not nearly that good. Sure, we’ve got to figure that there’s people out there that think anything Del Toro touches is amazing, and there’s this affinity for Chastain that I totally understand. Believe me, I love her and I she’s great in this. But strip away the names and what you have is another damn horror movie that doesn’t make any sense. Apparently, no one wants to abide by certain rules of horror. Just because you put creepy or scary scenes in a movie doesn’t mean that it’s scary. I’ll explain. In Mama, a frantic father Jeffrey (Game of Thrones‘ Nikolaj Coster-Waldau) runs in to retrieve his two daughters and drive off with them. He’s killed his two business partners and his wife, and it looks like he might do the same with his daughters, but then something wicked scary prevents him from doing it and we’re whisked 5 years into the future. His twin brother is still looking for his nieces, has hired a couple of guys to help out, and his punk-rock girlfriend Annabel (Chastain) sort of just accepts it as part of life. The daughters are found, kind of Nell-ish in their ways after five years of being in an isolated cabin. The older sister Victoria (Magan Charpentier) still has some of her vocabulary, but the youngest Lilly (Isabelle Nélisse) is kind of still living and talking like she’s back at the cabin. They survived by “inventing a mother figure” that took care of them, but we know better. A custody suit is waged between Lucas and another aunt, Jean Podalski (Jane Moffat, who also provides the voice of “Mama” in the movie), and suddenly Lucas and Annabel become parents of a particularly challenging couple of children. It’s here where there’s all sorts of creepy stuff happening. The sisters are in their room, often playing with someone who is unseen on camera, the mama ghost comes out of nowhere a few times to scare the audience for no reason. One of these appearances leads Lucas to the hospital, so Annabel has to take care of the children on her own, something we know will be difficult and unwanted because she was all excited about a negative pregnancy test early in the film. A child psychologist initially believes that some sort of psychological break is happening, but then after research he starts to believe that there might actually be a ghost involved with the sisters’ unusual behavior. And there’s a back-story involved, of course, as to how “Mama” came to be. So why do creepy/scary scenes not make a movie scary? Because a movie sets up a ghost’s power as something that is amazing, that they can do almost anything they want. So why doesn’t “Mama” do what she wants to do in the first place, which is to take the children and be with them forever and ever? This is what we understand by the end, which by the way, might be the best part of the movie because it’s a bit ballsier than most horror movies. But I don’t understand why a ghost comes out of nowhere to scream at people and then vanish, or to show up behind someone and do nothing, or somehow only be able to go so far when trying to take the children. There needs to be an established set of rules, or else all the scaring is merely for the audience, and that doesn’t make any sense to me. Now, it’s completely OK if there are sounds or scary things, and we realize that ghosts have certain limitations, and that’s why they don’t just go ahead and do what they want to do. But “Mama” is shown as pretty much all-powerful. 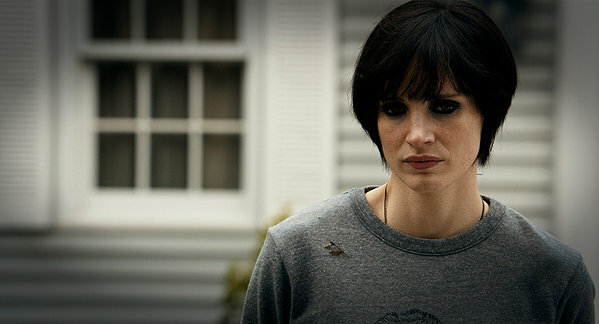 Anyway, despite Jessica Chastain being great, this movie isn’t very good. I think it has good elements, it’s better than the lowest of the low, but that’s as far as it goes. I chose to see “The Last Stand” instead this weekend and thought it was a lot of fun. I guess nobody else did though since “Mama” crushed it at the box office. I still think I made the right decision.